Announcing just release of the new app for iPhone, iPod touch and iPad called Durion Word Game 1.2 . 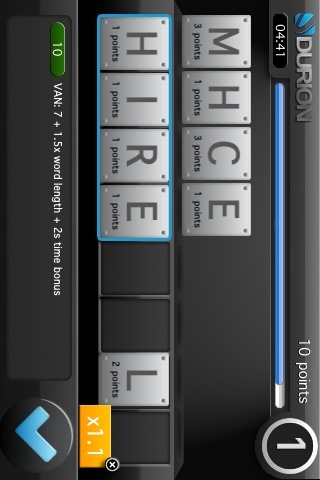 The app is word game, where players should form words from a group of letters in less then 5 seconds. New game play provides the users with lots of mental challenge and fun. Besides the addictive game play, the app developers Entwicklungsschmiede UG (haftungsbeschrankt) & Co KG, are offering a profitable price, reduced to 99 cents from it's regular price $1.99. Reduced price will last for 7 days, in celebration of the game’s debut in the U.S. marketplace. Originally from Germany, Durion has been adapted to an English speaking market, so that North American players can share in the fun and challenge. While playing the game, users must think and act fast as time, given for forming the words is limited to five seconds. Players with the highest scores make it to the national and global leaderboards. Durion Word Game 1.2 is only $1.99 (USD) and available worldwide exclusively through the App Store in the Games category.